Wind chimes are a very popular feng shui cure, and there is a variety of ways you can use them for good feng shui. In fact, wind chimes are one of feng shui's most common remedies, used both to suppress and cure negative energy, as well as to add energy where chi is lacking. Some authorities prefer to keep wind chimes outdoors in the garden where they are naturally suited (that's where the wind is, after all), but other practitioners feel no qualms about the careful use of wind chimes in indoor locations. A small wind chime containing small rock crystals, for example, can be very effective indoors. 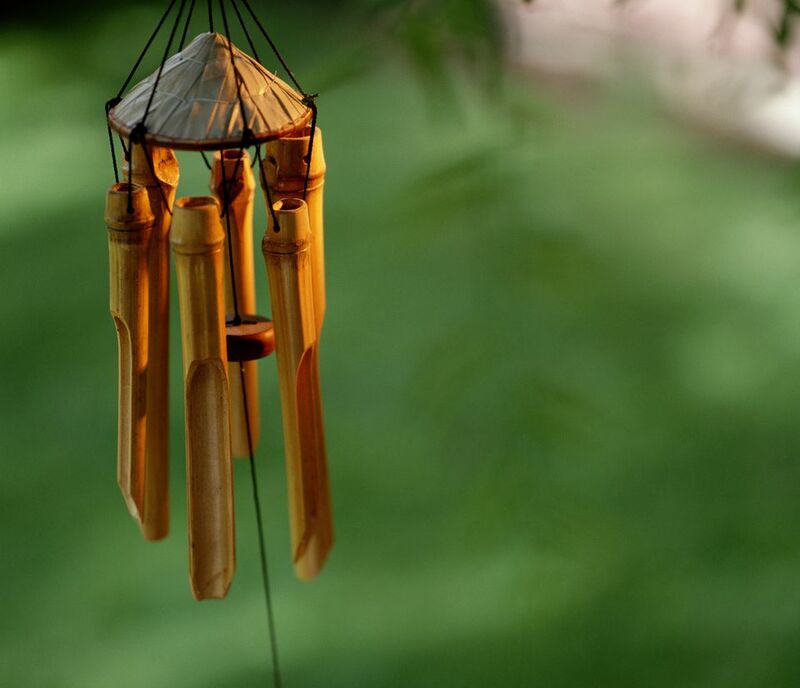 According to traditional feng shui schools, wind chimes are used mostly to cure negative energies, whether this means applying annual feng shui updates or challenging permanent energy patterns inside a home. If you need a strong metal feng shui element in a specific bagua area, such as northwest, for example, a consultant might recommend a metal wind chime with six strings/bells—six being the feng shui number for northwest. The recommended choice would be a wind chime with hollow tubes, so as to allow the potential sha chi to be transmuted into the sheng chi quality of energy. Always be mindful of matching the feng shui element or material used in the wind chimes to the bagua area element where you want to place it. A metal wind chime can be placed in the west, northwest and north, while a wood/bamboo chime can be placed in the east, southeast, and south bagua areas. Sometimes you can even find wind chimes made with porcelain or clay bells, which is an earth feng shui element best suited for the earth or wood feng shui bagua areas (center, southwest, northeast, east and southeast). As with any feng shui cure, be mindful not to weaken or damage the main element of a bagua area. For example, do not place a metal wind chime in the east (wood element area) or a wood chime in the earth element area (southwest). Some authorities believe that hollow chime rods are the best choice where you seek an energizing influence, while solid rods are best where you seek to suppress energy. There is some debate over this, however. Many feng shui wind chimes come with traditional symbols, such as a feng shui chi lin wind chime for protection, or the mystic knot wind chime for abundant energy. A clay wind chime with two hearts will obviously be an excellent choice for the southwest (love and marriage) area of your home or garden, while a chime with a Buddha image will work well with the feng shui energies of the northeast (spiritual growth) and self-cultivation bagua areas. When using a wind chime as a feng shui cure, also pay attention to the number of the rods or bells. Numbers 6 and 8 are the most popular numbers of bells in a wind chime if you want to increase the beneficial energy, while 5 is considered best when you want to suppress bad energy—most often from an annual feng shui star. If you love wind chimes, be sure to use them in your feng shui applications, and don't be afraid to bring them indoors. Just make sure to consider the materials, symbols, and number of rods/bells when choosing wind chimes that are best suited for the location and purpose you want. Don’t hang wind chimes over a door so that it can be hit by people or the door itself. Don't hang metal wind chimes in trees, since the metal element will clash with the wood in the tree. Wooden chimes are okay when hung in trees. Don't hang wind chimes where people will sit or sleep directly under them. The energizing influence can be disturbing to people in direct contact. Do use wind chimes in areas that gather clutter. The chimes will break apart the "stickiness" of the energy in these areas and make them easier to keep clean.